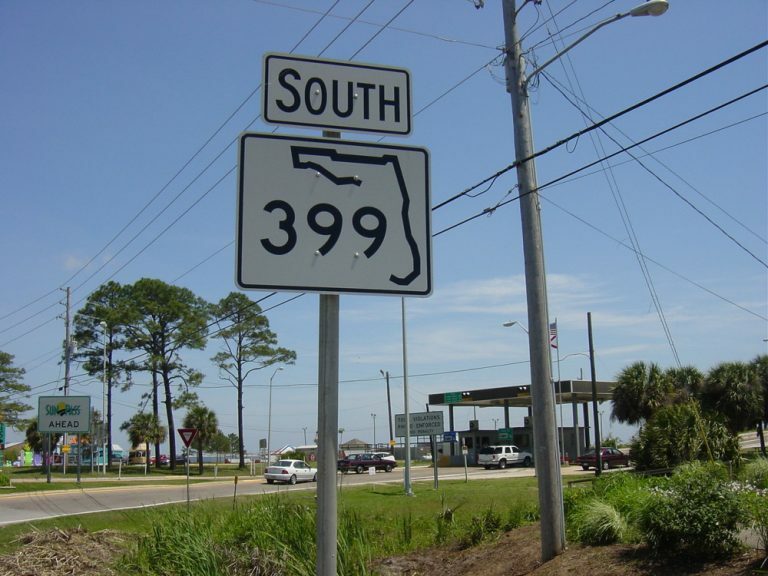 State Road 399 previously connected U.S. 98 at Gulf Breeze with Pensacola Beach and Via De Luna Drive east to Gulf Islands National Seashore and Navarre. A jurisdictional shift from state to county maintenance occurred with the Bob Sikes Bridge across Santa Rosa Sound and portions of Pensacola Beach Boulevard, the connecting roadway, in 1999. This left just 0.319 miles of SR 399 in the system, which entails the trumpet interchange with U.S. 98 and the immediate approach to the toll bridge. The toll bridge is one of two crossings from the mainland to Santa Rosa Island. Historical look at the southbound beginning of Florida 399 at the foot of the Navarre Beach Causeway. Drivers crossing Santa Rosa Sound first entered a small toll plaza, where tolls were charged at a rate of $1.00 per passenger vehicle, before they spanned the Intracoastal Waterway. Photo taken by Jeff Royston (04/21/02). Further east at Navarre Beach, State Road 399 became County Road 399 after tolls were removed from the Navarre Beach Bridge on July 1, 2004. This coincided with a county takeover of the span from the state. State Road 399 shields were still in place until 2006. The southernmost segment of County Road 399 travels Gulf Boulevard east from J. Earle Bowden Way and the Escambia County line to Navarre Beach Causeway. County Road 399, unsigned along J. Earle Bowden Way, emerges from the Gulf Islands National Seashore as the main road along Santa Rosa Island through Navarre Beach. Numerous beach homes, summer rentals, and a crop of condo high rises line the two-lane 35 mph roadway. A multi-use trail follows the north side of the roadway as well. County Road 399 turns northward at the entrance to Navarre Beach County Park for the causeway and bridge across Santa Rosa Sound. This two-lane roadway opened in 1960 and includes two bridges: a high rise span over the Intracoastal Waterway, and a low level bridge over a relief channel. Tolls ($1.00 per passenger vehicle) were charged for the crossing until July 1, 2004 when Santa Rosa County took over control of the bridge from the state. Santa Rosa 399 ends at U.S. 98 in Navarre. State Road 399 was downgraded from Navarre to Gulf Islands National Seashore after the maintenance handover from the state to Santa Rosa County in 2004. Signage for the state road remained until 2006; county road signage did not appear until April of 2011 after an inquiry was made by AARoads to the County regarding the road's status. Eastbound Fort Pickens Road after Galvez Court. A number of condos and homes line both sides of the road from the National Seashore boundary to Little Sabine Bay. Photo taken 09/22/09. Unsigned County Road 399 continues from Sabine Drive on a narrow strip of land between the Gulf of Mexico and Little Sabine Bay. Photo taken 09/22/09. Fort Pickens Road ends at Pensacola Beach Boulevard (County Road 399) north and Via de Luna Drive (County Road 399) east at Quietwater Beach and Boardwalk. Pensacola Beach Boulevard returns to Gulf Breeze while Via de Luna Drive leads east through Pensacola Beach to the Santa Rosa Area of Gulf Islands National Seashore. County Road 399 is unsigned in all directions at this intersection. Photo taken 09/22/09. Hurricane Ivan washed out Fort Pickens Road within Gulf Islands National Seashore. The road remained closed until May 22, 2009. Photo taken 02/09/06. View of the Navarre Beach Bridge from the north shore of Santa Rosa Sound. Photo taken 03/10/09. Northward look at the Navarre Beach Bridge from the artificial island midway across Santa Rosa Sound. Photo taken 03/10/09. Emerald green waters at Gulf Islands National Seashore. Photos taken 03/10/09. A cold winter day leads to wide open beaches at the county-maintained portion of Pensacola Beach near the Portofino towers. A 2.7-mile stretch of County Road 399 lines beaches east of the developed portion of Pensacola Beach and west of Gulf Islands National Seashore. Photos taken 02/09/06. Just south of the intersection of Fort Pickens Road and Via de Luna Drive is the main public beach of Pensacola Beach. The area includes Gulfside Pavilion and the Pensacola Beach Gulf Pier. Photos taken 09/22/09. A large public parking area lies on the north side of County Road 399 before the entrance to Gulf Islands National Seashore. Northerly views of Santa Rosa Sound reveal Deer Point of Gulf Breeze and distance Pensacola Naval Air Station. Photos taken 02/09/06. Looking west from the north shore of Santa Rosa Sound at the Naval Live Oaks area of Gulf Islands National Seashore at the Bob Sikes Bridge joining Gulf Breeze with Pensacola Beach. The fixed high level bridge shadows portions of the former two-lane draw bridge below. Photo taken 10/22/11. Portions of the original State Road 399 bridge across Santa Rosa Sound remain in use as fishing piers. This view looks at the southern pier from along side the high rise Bob Sikes Bridge. Photo taken 02/09/06. 09/22/09 by AARoads and Carter Buchanan.